JEFFERSON CITY, Mo. 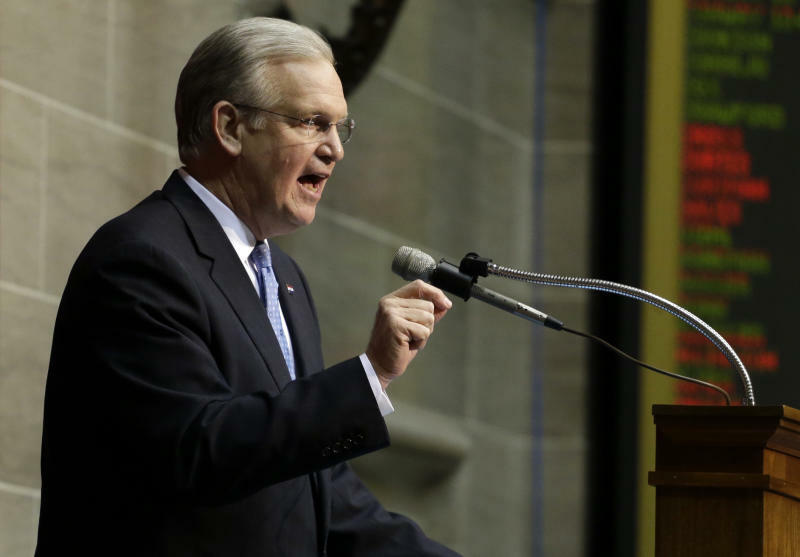 (AP) — With the help of a few Democrats, Missouri's Republican-led Legislature appears to be positioned to override Gov. Jay Nixon's veto of a high-profile bill that seeks to nullify federal gun-control laws in the state and make criminals out of federal agents who attempt to enforce them. Several of Nixon's fellow Democrats confirmed to The Associated Press that they would vote to override his veto when lawmakers convene in September, even while agreeing with the governor that the bill couldn't survive a court challenge. Many of them noted that in some parts of Missouri, a "no" vote on gun legislation could be career ending. "We love our guns and we love hunting. It's not worth the fight for me to vote against it," said Rep. T.J. McKenna, D-Festus. But, he added, "the bill is completely unconstitutional, so the courts are going to have to throw it out." The legislation would make it a misdemeanor for federal agents to attempt to enforce any federal gun regulations that "infringe on the people's right to keep and bear arms." The same criminal charges would apply to journalists who publish any identifying information about gun owners. The charge would be punishable by up to a year in jail and a $1,000 fine. Nixon said the bill infringes on the U.S. Constitution by giving precedence to state law over federal laws and by limiting the First Amendment rights of media. The legislation is one of the boldest measures yet in a recent national trend in which states are attempting to nullify federal laws. A recent Associated Press analysis found that about four-fifths of the states have enacted local laws that directly reject or ignore federal laws on gun control, marijuana use, health insurance requirements and identification standards for driver's licenses. Relatively few of those go so far as to threaten criminal charges against federal authorities. McKenna was among 11 House Democrats who joined Republicans to pass the Missouri gun legislation in May, by a 116-38 vote. The bill cleared the Senate 26-6, with two Democrats supporting it. A veto override needs a two-thirds majority in both chambers, or 109 votes in the House and 23 in the Senate. Republicans hold 24 Senate seats. Although Republicans currently hold 109 House seats, they're down at least one of their own. Rep. Jay Barnes was the only Republican to vote against the original bill and said he opposes a veto override. "Our Constitution is not a Chinese buffet, which we like and do not like," the Jefferson City attorney told the AP. "The First Amendment is part of the Constitution that we must uphold. ... (And) the supremacy clause means that states cannot criminalize the activities of agents of the federal government." If the rest of the Republicans stick together, and none are absent, that means they will need at least one Democratic vote to override the veto. But so far, at least three House Democrats — McKenna, Keith English of Florissant and Ben Harris of Hillsboro — said they would support a veto override, and Democratic Rep. Jeff Roorda of Barnhart said he was leaning toward it. "Being a rural-area Democrat, if you don't vote for any gun bill, it will kill you," Harris said. "That's what the Republicans want you to do is vote against it, because if you vote against it, they'll send one mailer every week just blasting you about guns, and you'll lose" re-election. Four other Democrats who voted for the bill told the AP they were now undecided. At least one of the original Democratic "yes" votes — Rep. Steve Hodges, of East Prairie — said he would switch to a "no." This year's vetoed gun bill is entitled the "Second Amendment Preservation Act" — a label that some Democrats said makes it politically risky to oppose. Democratic Rep. Ed Schieffer, who proclaims himself "100 percent pro-gun," said he voted for the bill in May with an eye toward a potential 2014 state Senate campaign against Republican Rep. Jeanie Riddle, of Mokane, who also supported the bill. Schieffer, of Troy, said he is undecided whether to support a veto override. "I personally believe that any higher court will probably rule this particular gun law unconstitutional — on that, I probably agree that the governor's right," Schieffer said. "But I may end up still voting for the gun bill, because I don't want to be on record for not supporting guns."